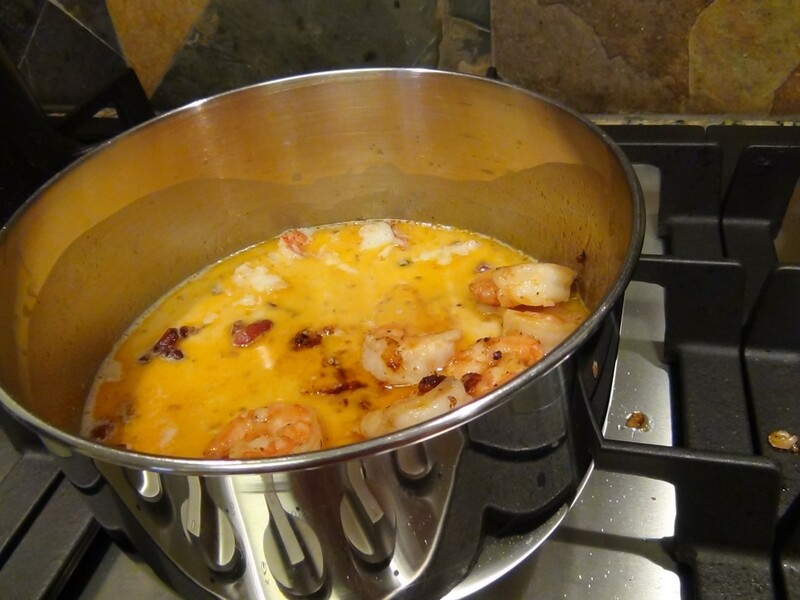 My dear friend Rosanne gave me her Lobster Bisque recipe. She inspired this recipe I invented which is a kind of infusion between her Lobster Bisque and Cajun Etouffée. The luscious creamy rich soup goes well with “Home Made Sourdough Bread”, click on the bread picture for recipe. 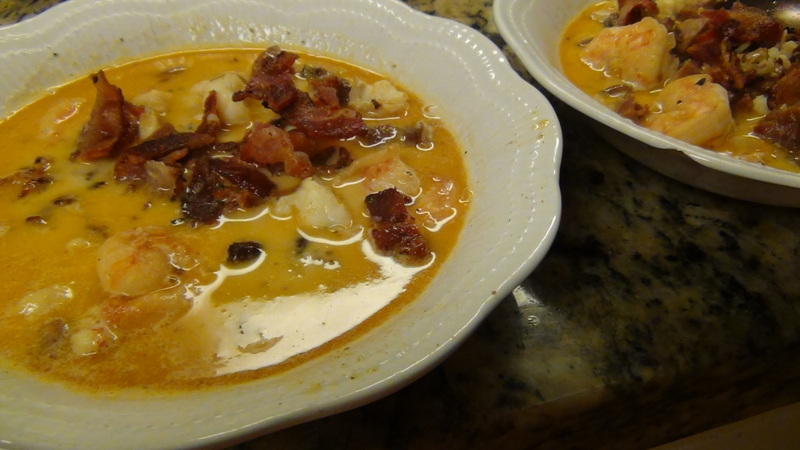 The seafood and sausages are sautéed in bacon drippings and sweet butter. The two stocks are: Crab butter stock and Chicken bone broth* Umami greatness is achieved with the sweet, hot, salty, rich and spicy combinations. Their savory mouth feels lingers seductively begging for more. Makes 2 servings. Pre-heat soup bowls. 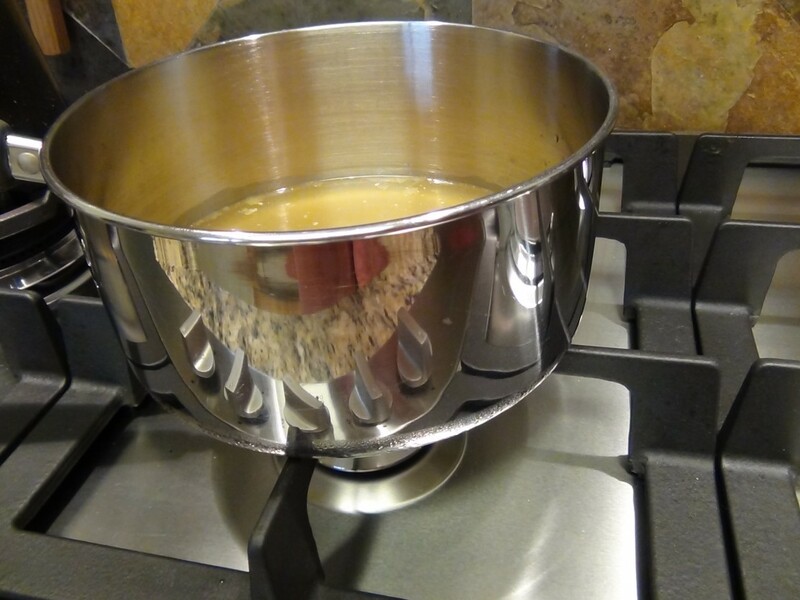 In 2-3 quart pan simmer stocks. 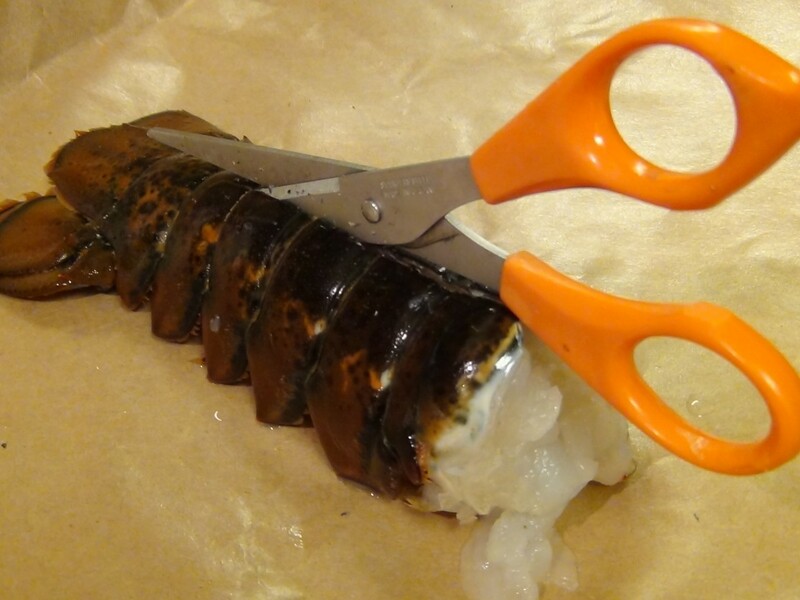 Cut open lobster on both sides as shown with scissors. Remove from shell and slice in half. 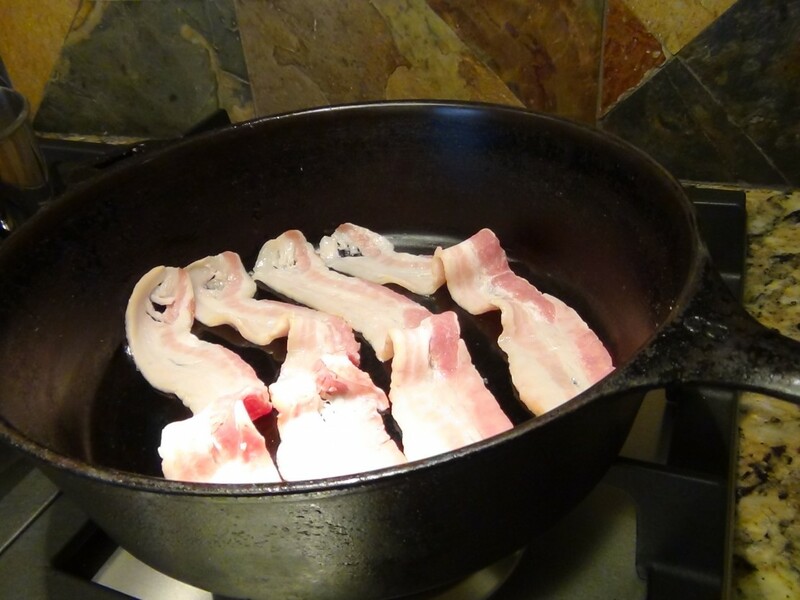 On Medium heat cook bacon and set a side on towel. Dice sausage and cook in bacon drippings. Remove and set on towel. 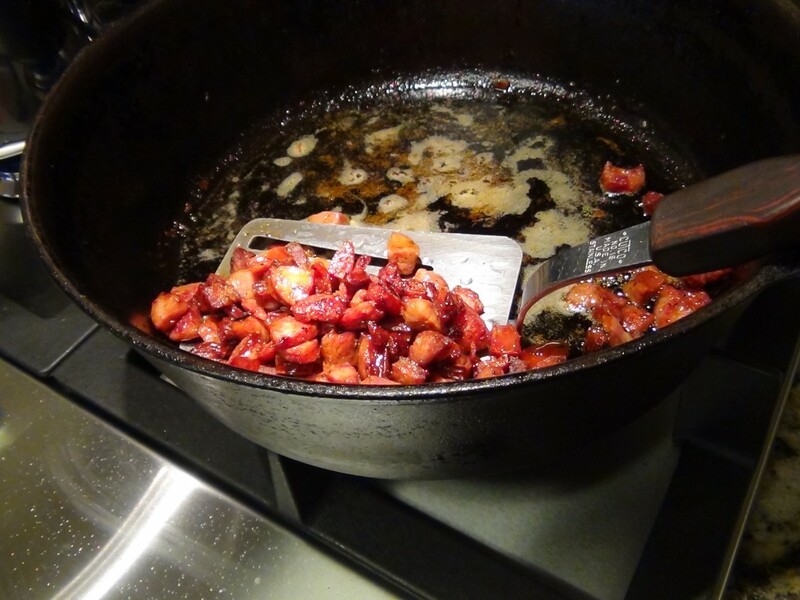 In same pan with out removing bacon drippings or sausage residual, add 1 & 1/2 teaspoons sweet butter and cook lobster. When meat is no longer opaque remove, usually 3-4 minutes on each side. Remove and set on towel. 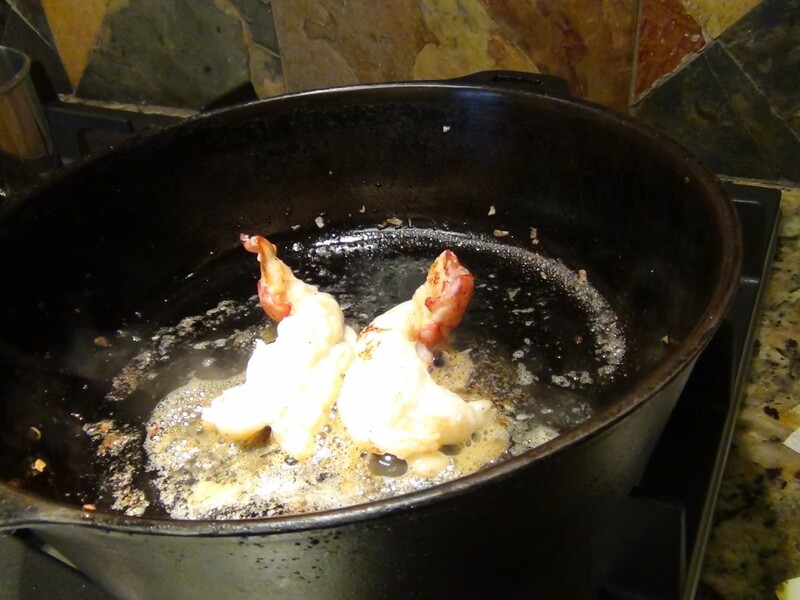 Add 1 & 1/2 teaspoons butter and cook shrimp, also until no longer opaque, approx. 2-4 minutes on each side. In same pan cook onions until lightly browned. Add cream and remaining tablespoon of butter into stock. Chop lobster and add along with sausage, shrimp and onions to stock. Mix in salt and pepper. Gently increase soup to serving temperature. Place in pre-heated soup bowls. Crumble bacon on top. Sever with hot sourdough bread. *Click on crap shell picture to see video recipe of Crab and Chicken bone broth. 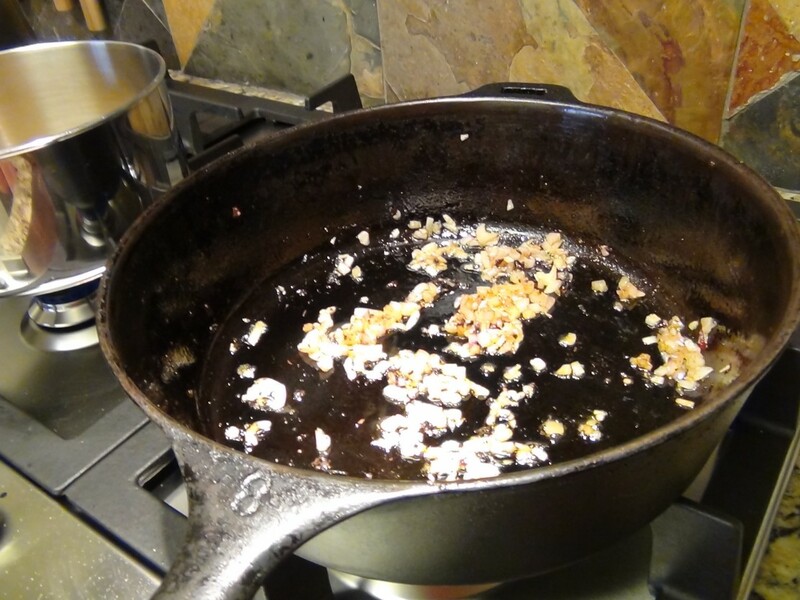 *Crab butter stock is simple. After cleaning crab from shells, you’ll see yellowish little fat nodes. 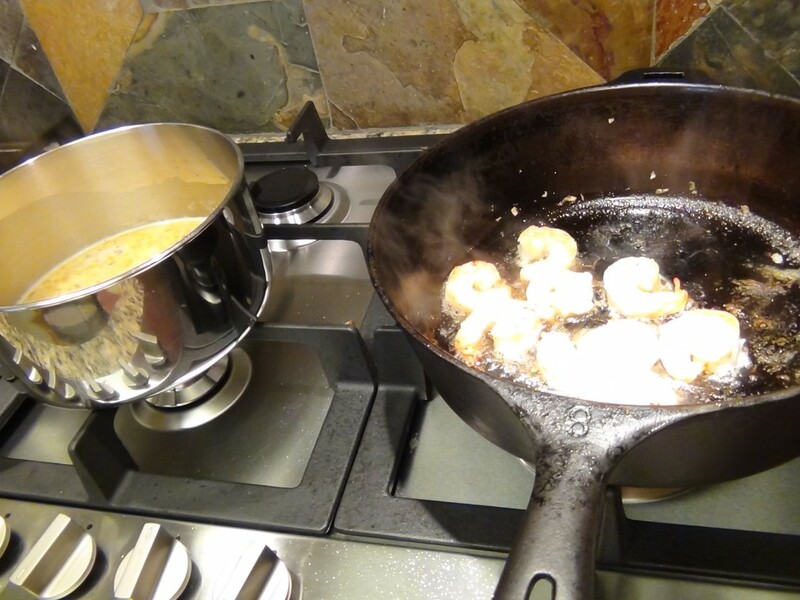 Place the shells along with the crab butter “fat nodes” in a large stock pot. 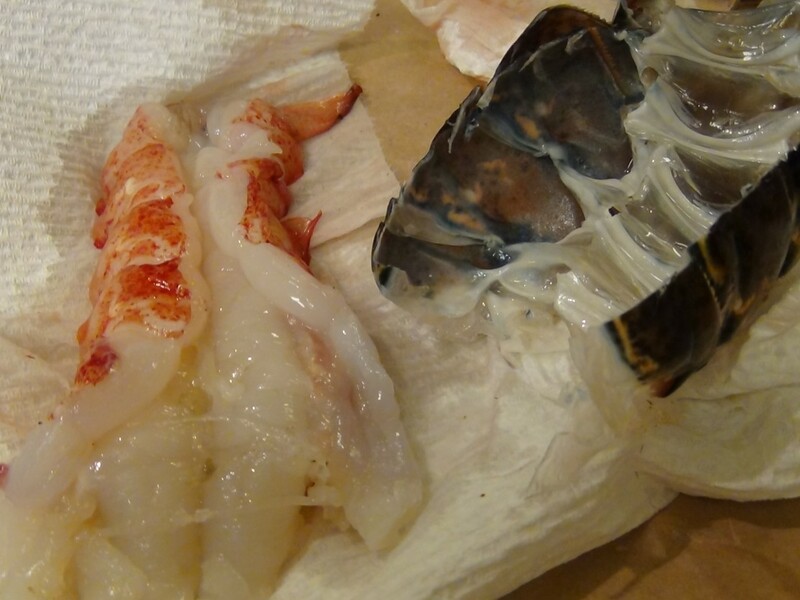 The rich butter stock can also be made from the shells & butter rich heads of, crayfish, lobsters or shrimp. Add cold water to cover and 1-2 tablespoons vinegar. Let soak for 1 hour. Bring to a boil. Simmer and hour or even 24 but on lowest heat setting. Crock pots work well for this. Remove shells, discard. Cook down a bit more. Strain into glass jars, cool, and refrigerate for use in no more than a week, or freeze for up to 6 months. The stock is exceptional in roux, sauce or gravy for seafood dishes.